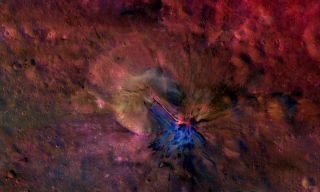 Scientists created this composite image of Vesta's crater Aelia, revealing the flow material on the inside and outside of the crater. The subdued, gray-hued photos of the enormous asteroid Vesta captured by NASA's Dawn spacecraft last year have received an overhaul. The original black-and-white image of Aelia crater, for comparison purposes. By matching colors to the various wavelengths, scientists have revealed geologic structures invisible to the naked eye while also creating images of the asteroid Vesta that seem more like works of art. Scientists at the Max Planck Institute for Solar System Research in Germany re-analyzed images of the asteroid taken by Dawn's framing camera, selecting different colors for the varying wavelengths of light. "The key to these images is the seven color filters of the camera," Andreas Nathues, framing camera lead at Max Planck, said in a statement. Because minerals affect wavelengths of light differently, the filters revealed differences in the composition of the asteroid that might otherwise have gone unseen. The northwest region of Vesta's crater Sextilia (at the bottom right of this image) reveals material likely carried in by an impact (black), as well as material that was probably created by melting (red). The new images reveal geologic structures such as buried craters, impact melts, and material carried in by falling space rocks, scientists said. Launched in 2007, the $466 million Dawn mission visited Vesta from July 2011 to September 2012. Upon departing Vesta, the probe began its journey to another denizen of the asteroid belt, the dwarf planet Ceres. When it arrives at Ceres around the end of March 2015, Dawn will become the first object to have orbited two solar-system bodies beyond Earth. Vesta and Dawn are ancient objects that have undergone very different evolutionary paths. Mission scientists hope that Dawn's observations of both bodies will reveal insights about the early days of the solar system. Although Dawn left Vesta nearly a year ago, the recent images show that the wealth of data it gathered is continuing to bear fruit, researchers said. This colorized composite image from NASA's Dawn mission shows the crater Antonia, which lies in the enormous Rheasilvia basin in the southern hemisphere of the giant asteroid Vesta. The area lies around 58 degrees south latitude. Antonia has a diameter of 11 miles (17 kilometers). The image was taken by Dawn's framing camera from September to October 2011. "No artist could paint something like that," Martin Hoffman, also of Max Plank and a member of the framing camera team, said in a statement. "Only nature can do this."